Welcome to the March 2010 edition of K Monthly, a look back at some of the best original coverage, including reviews, previews, features, weekly columns and more from Kotaku. Don't miss our reporting from this year's PAX East gathering, Penny Arcade's video game convention for the video game fan, and the annual Game Developers Conference, which spawns more than just hands-on previews of the most exciting upcoming games, but insight from and interviews with the video game industry's most fascinating people. GDC 2010 was also where we got our first hands-on time with the PlayStation Move, Sony's second stab at motion control gaming on the PlayStation 3. 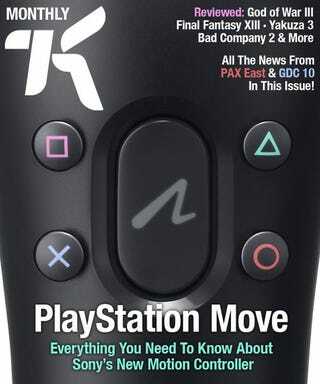 Get caught up on all of Kotaku's original coverage with the March edition of K Monthly. Toy Soldiers Micro-review: A Farewell To Arms? Brother In Arms 2 Micro-Review: Oh, Brother Where Art Thou? Greed Corp Micro-Review: Is Greed Good? Max & The Magic Marker Micro-Review: What If The DS Was My TV? EA Sports MMA: Who Knows About Broken Bones?